154CM stainless steel has long been a sought-after metal for knife makers. The addition of molybdenum over 440C steel gave 154CM far superior edge holding, while still maintaining the same corrosion resistance. 154CM and its twin, ATS-34, were not without their own drawbacks, however. Knifemaker John Barlow earlier this year sat down with Blade Magazine and explained why he switched to CPM 154 for his knives. “I started out with 440C stainless steel a million years ago,” Bartlow remembered. “I quit that nearly 20 years ago and jumped to ATS-34 stainless and used it for years and years.” Although ATS-34 is considered a high-end stainless steel for knife blades, John noticed something when looking at his blades under magnification. “My customers never noticed it but it bugged me,” he continued. “I was trying to get some finishes in that stuff —and I was buying through normal channels from several suppliers—but when I would go to finish it, once in a while I’d get this little area that looked like it had pits in it, or it kind of had a little ‘road rash’ that I could not get rid of.” Structurally, the metal was perfectly fine, but finicky knife makers who had been using 154CM and ATS-34 for decades began noticing the same thing. John decided to start using CPM 154 and never looked back. “They are closely related on the family tree of steel,” he said. In CPM 154, he realized that this was a material that allowed for a flawless finish. With the powdered metallurgy process and the accompanying uniform distribution of carbides, it eliminated the “road rash” issue some knife makers were experiencing. Both steels have the same properties except that the CPM 154 is the Particle Metallurgy version. 154CM was first developed for jet turbine blades in the 1970’s, so it’s quite a good quality steel. 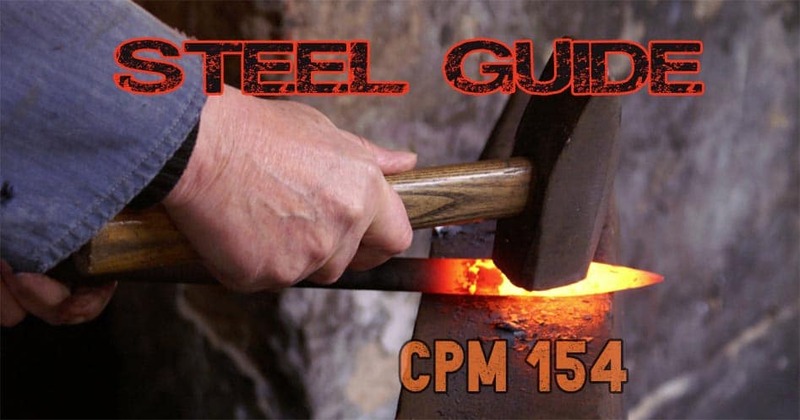 The “C” stands for the name of the metal company (Crucible), and CPM 154 is a re-introduced version of the 154CM, but it’s a more advanced (some say “cleaner”) version of the steel. CPM 154 is a martensitic stainless steel, having less chromium and very little nickel as compared to Austenitic steels. This also makes it magnetic. Martensitic steels have higher levels of carbon which allows for the formation of Martensite, an extremely hard structure making it ideal for knife making. CPM 154 aims for a Rockwell C hardness of 58 – 60 Rc. The composition is exactly the same as it is for 154CM, the only difference being the CPM forming process. It holds a better edge and has a higher corrosion resistance than 154CM as well. It will more readily polish to a mirror finish and is easier to grind than CPM S30V. The CPM process also has a leg up on 154CM in that the powdered steels can be heat treated to maximum effectiveness. 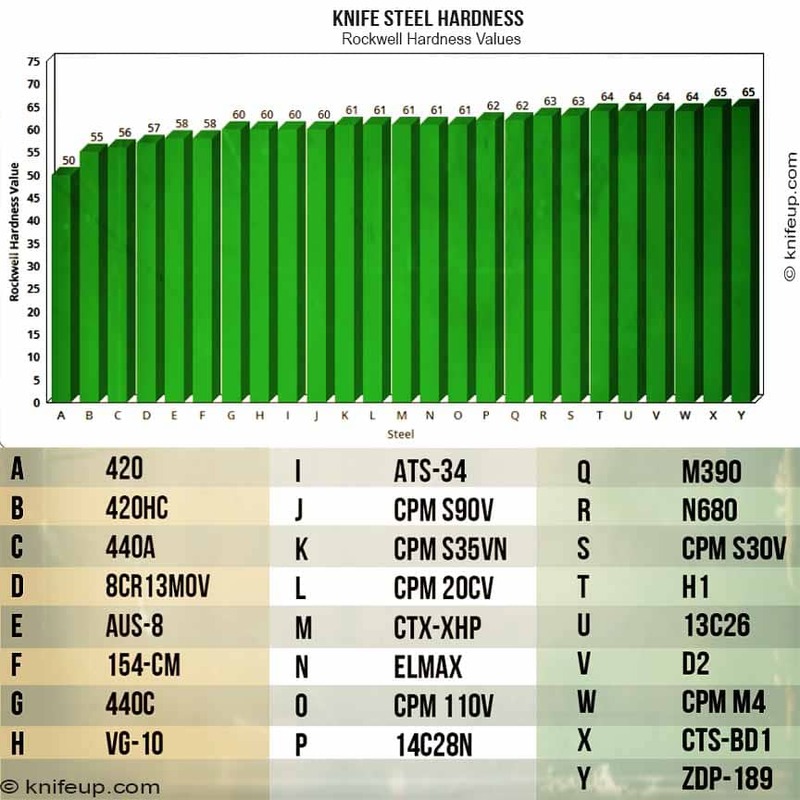 When compared with 440C, the standard by which most stainless knife steels are measured, CPM 154 has better edge retention and chip resistance, plus dimensional stability. The general machining parameters are similar to 154 CM, ATS-34 (Hitachi) and 440C. Many knife makers utilize CPM 154 for their higher end knives. Brands like Kershaw, Hogue, and Bark River use it extensively. Picking a favorite with so many excellent brands to choose from is a heavy task. The Kershaw Launch 6 is a personal favorite of mine. 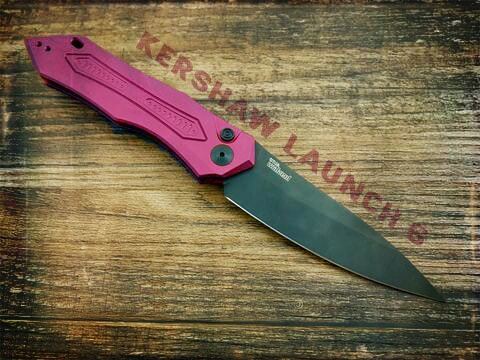 Kershaw has been in the knife making business for a very long time and they know how to build a quality product. The Launch 6 is an automatic tactical folding knife featuring a sleek design and all-purpose designation. The CPM 154 blade is a 3.75-inch drop point that is 0.12-inches thick. It has a flat blade grind and DLC coating, making the Launch 6 even more corrosion resistant. The 4.95-inch handle is made from aluminum and features a red bullseye launch/lock button. The locking mechanism is a plunge lock style, ensuring a tight lock-up and no play in the blade when extended. The tip-up style pocket clip is reversible. This 8.7-inch overall length powerhouse of a knife comes in at a very light 3.8 ounces. The contours of the machined handle are subtle, yet give a comfortable grip to the knife. There is no gimping, resulting in a very long centerline that aligns with the handle. The handle features a lanyard hole, although a lanyard does not come with the knife. Overall, the Kershaw Launch 6 is an excellent EDC tactical automatic folder that is comfortable to use and carry, and with the CPM 154 blade, you can be sure that this knife is going to last a lifetime. The knives being created today are all technological wonders as compared to their ancestors. CPM 154 is one such material as it is far superior to many steels out today. It is really a jack of all trades metal that can be worked easily, yet retains its characteristics of chip resistance, edge retention, corrosion resistance, and ease of sharpening. Those manufacturers that use CPM 154 have recognized this steel for making a great blade that checks all of the boxes consumers and collectors alike share. It begins with a very good steel, 154CM, and really takes to the next level in terms of workability and usability. To be sure, CPM 154 will be around for a very long time in knives of every application. Try one of these knives and you may just be a fan for life!